I entered my first Newport to Ensenada Race in 2003. It was a windy race and I finished in about 22:47 in the cruising gennaker class. The following two years were slower, but great compared to the last three years. My slowest time was about 26:49. The significance of those earlier races was that they all were Saturday afternoon finishes. It was easy to have dinner in town while the sun was still shining. That was in my previous boat, a 1986 Cal 33, which was a faster boat than "Narrow Escape", but not hugely faster. 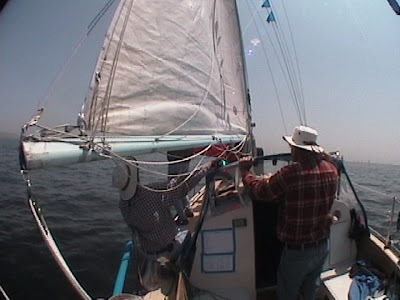 I entered my Ericson 30 in 2005 and dropped out after four hours and about four miles sailed. About 20% of the entrants gave up that year. Last year I was refinishing the boat and missed an even slower race in which about half the entrants failed to finish. This year, about 19% again failed to make it, and I was among them. We drifted across the start line at 0.2 kts. under a nylon windseeker jib and mainsail. We were the first or second boat across, but we weren't moving. The eventual winner, Fair Havens, a Newport 28, headed offshore farther than nearly everyone else and disappeared. Meanwhile we got the Ericson moving and stayed ahead of the rest of the 10 boats that started in our cruising non-spinnaker class. I was particularly pleased at our growing lead against the only other original model Ericson 30 in the race. By late afternoon we had passed the latitude of Dana Point and the San Onofre nuclear power plant and were doing 5-6 kts. We also were trending west of the rhumb line course, and even west of a course to take us a couple miles outside the North Coronado Island. But by 8:32 pm the wind had mostly died and we were down to 1-2 kts. The cruising class allows engine use between the hours of 8 pm and 8 am, not to exceed 12 hours total for the race. The penalty works out to about two minutes for every minute under power, which is added to the corrected time calculated on the boat's PHRF rating. It seems a worthwhile tradeoff when motoring is more than twice as fast as sailing. But a quick review of past race results will reveal that the winners of cruising classes sail the whole race. I had another consideration. My crew of five was larger than the number of berths available. In fact, I thought that two people would have to sleep in the cockpit because the v-berth up front seemed more suited to two people who wanted to maintain contact all night than for a couple of guys who value having their own space. Thus in early February I was able to reserve a suite at the Hotel Coral, which conveniently also had a marina in which I intended to tie up rather than anchor inside Ensenada harbor. There is a two-night minimum on weekend room reservations. With tax, that woujld total a little over $400 US. So I had a strong economic incentive to get to Ensenada in time to enjoy my expensive hotel room. We were able to stop the engine and raise it out of the water in the wee hours of Saturday morning for 1:05 hours of sailing at 4-5 kts. Then the wind disappeared and we restarted the engine. Things didn't improve much after the mandatory 8 am sail-only cut-off. It wasn't until mid-morning that we were able to get above 2 kts., but it didn't last long. The wind died. Wind ruffles teased us on the water nearby, but seldom developed into anything useful. Eventually, with me at the tiller, we did an uncontrolled (and uncommanded, I insist) 360-degree turn while the knotmeter indicated 0.0 kts. Finally at about 1 pm Saturday and about 26 miles from Ensenada, I exercised my authority and decided we were dropping out and motoring the rest of the way. I did have support among the crew, but not enthusiastic support and maybe not universal support. There was no move to mutiny, however. Thankfully. I had allowed them to keep their riggers knives and it could have been ugly. As we motored toward Ensenada, of course, the wind grew boisterous. It was windy where it isn't supposed to be windy according to race lore. That was along the shore, which has a reputation for being a graveyard. Some boats were sailing hard through that graveyard heeled strongly to starboard from the offshore, Santa Ana-like wind blowing down off the mountains north of Ensenada. Meanwhile, we noticed that boats that did manage to struggle out to Todos Santos Island, from whence experienced skippers typically make their approach to the finish line, seemed not to be moving. We arrived at the Hotel Coral Marina before sunset and had a good dinner in town at the Mahi Mahi restaurant. Afterward, we sat on the fifth-floor balcony of my room and watched an endless stream of sailboats make their ways to the finish. Some were moving smartly. Some barely moved. We felt confident that it would have been sometime Sunday morning before we had arrived had we stayed in the race.